Southern Fried Chicken: America’s Ultimate Comfort Food. And Mine. As I’ve mentioned before, ours was a family of modest means. But my father worked hard to see that we were able to afford some of life’s nicer things. An occasional dinner at the “Log House” after Sunday’s church service was one of the more pleasurable of them. And one of my life experiences I will likely never forget. 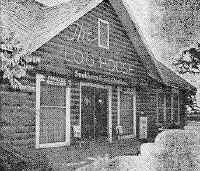 The Log House, as the name implies, was a real log cabin in which a popular restaurant was housed. It was unique, affordable, and located right on the way home from our house of worship. 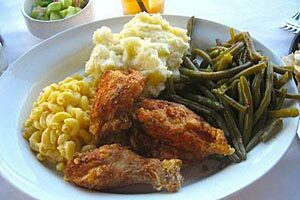 But best of all, this restaurant specialized in southern fried chicken–one of my family’s favorite meals. Now for those of you not familiar with southern fried chicken (and I’m not sure who that could possibly be) the following paragraphs will attempt to clarify what it is, its origin, and perhaps a few other interesting facts. 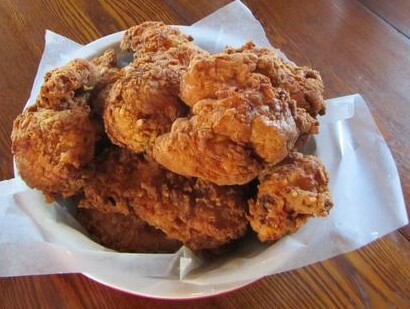 Simply put, southern fried chicken consists of a young hen that has been cut up–usually into eight pieces–dredged first in buttermilk, then in well seasoned flour, and fried in lard (or some other fat) in a cast iron skillet, rendering the exterior with a crispy outer shell that keeps the meat juicy and tender. And while this may sound straightforward enough, making great fried chicken is an art mastered by only a few, and then only after months, sometimes years, of practice, trial, and error. It is also worth noting that the term “southern fried” is a relatively recent term, not appearing in print until 1925. While fried chicken was not particularly popular in the northern United States until well into the nineteenth century, it is certainly a traditional southern meal and among the region’s most well known exports. But the dish is not indigenous to the South. Actually, most food historians credit Scottish immigrants–who preferred frying their chicken over baking or boiling, as did other Europeans–with first introducing the dish to Southern colonies as they migrated here in the mid eighteenth century. And while the Scots may have brought fried chicken to America, it was West Africans, brought here as slaves, that helped make it a southern staple. 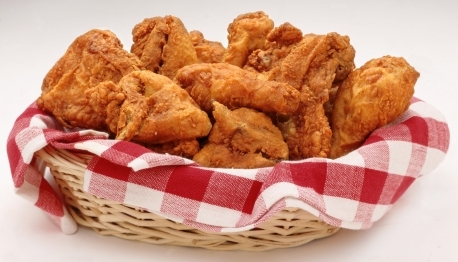 Fried chicken is known to have been a common part of many West African cuisines. As the slave trade led to Africans being brought to work on southern plantations, those whose job it was to cook for the owners brought with them spices and seasonings that greatly enhanced the flavors of Scottish fried chicken recipes. Fried chicken was also well suited for plantation life, as it provided cheap but nutritious sustenance for both owners and slaves alike. And chickens were about the only meat African American slaves were allowed to raise. As the American Civil War began to wind down and it became necessary for former slaves to create new lives for themselves, some turned to trades learned during slavery. But one group of African American women from the town of Gordonsville, Virginia turned to fried chicken as a means of providing a living for themselves and their families, earning the name “Chicken Vendors” along the way. It seems Gordonsville was an important train junction for the Confederacy and, as such, highly defended during the Civil War, surviving virtually unscathed. When the war ended in 1865, passenger service was restored quickly. 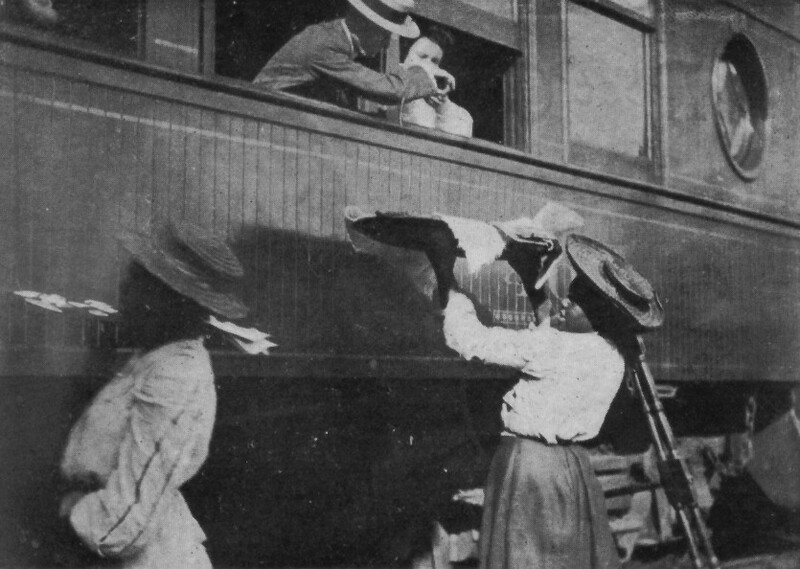 But trains at that time had no dining cars, and passengers had no choice but to eat at trackside establishments. The Chicken Vendors greeted the waiting rail cars with trays of fried chicken and baskets of rolls, selling wares to passengers through open windows–legs and breast was fifteen cents; backs and wings, five and ten cents. This practice continued until the mid-1900s when health regulations forced it to stop. By the end of the nineteenth century the popularity of fried chicken in the South had grown to become the region’s top choice for Sunday dinner and special occasions among both blacks and whites. Today fried chicken, like America itself, has taken on a new look. Modern, forward thinking chefs craft versions of this classic dish never before fathomed and certainly a far cry from that first recipe published by Mary Randolph in her 1824 cookbook The Virginia House-Wife. And although good fried chicken can be found in just about every state in the country, great fried chicken can, at least in my mind, only be found in the South. Places like Willie Mae’s Scotch House in New Orleans, Prince’s Hot Chicken Shack in Nashville, Husk in Charleston, South Carolina, or the Busy Bee Cafe in Atlanta. So while the Log House Restaurant burned down many years ago, those childhood after-church Sunday dinners and my father’s “little bowl of cream gravy” will forever be etched in my memory. And the taste of fried chicken forever on my tongue.